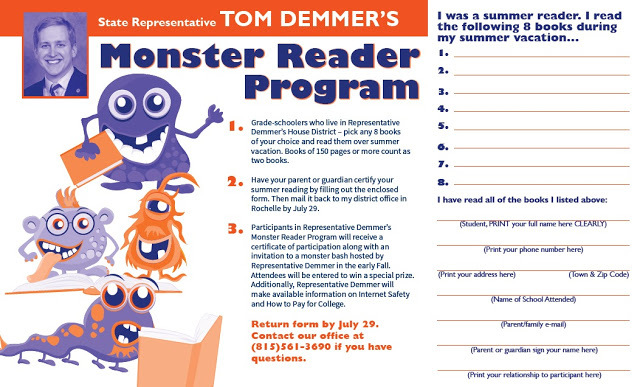 Dixon…State Representative Tom Demmer (R-Dixon) announced the official launch of his Summer Reading Club “Monster Reader” Program for grade school students who live within the 90th Illinois House District. The program is offered to encourage summer reading among local youth and promote the lifelong benefits of literacy. Free brochures are available for download on Rep. Demmer’s legislative website at tomdemmer.com or by calling his Rochelle District Office at (815) 561-3690. Participating students are tasked with reading eight books over their summer break. Books from local library programs are accepted; and books of 150 pages or more count as two books. 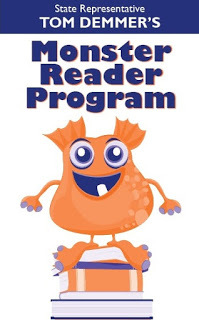 After a student completes his or her reading list, they must have a parent or guardian certify the reading was accomplished and return the signed form on the brochure to Rep. Demmer’s office by the deadline of Friday, July 29. 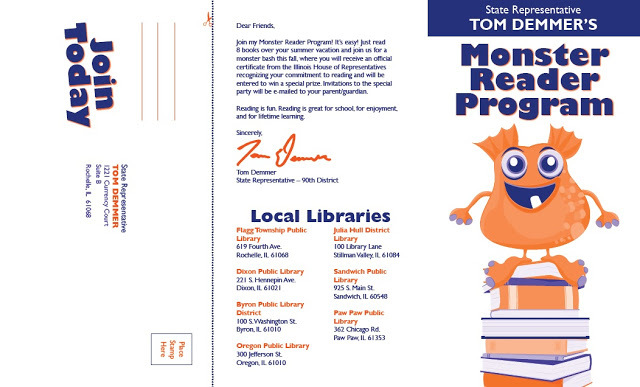 Students who successfully complete the reading club will receive a certificate of participation along with an invitation to a monster bash hosted by Rep. Demmer in early Fall, where attendees will be entered to win a special prize and information on internet safety and college savings programs will also be available. To request a brochure or confirm your residency in the 90thDistrict, Rep. Demmer can be contacted at his district office located at 1221 Currency Court, Rochelle, IL 61068 or by calling the office at (815) 561-3690.